Sure it may be the middle of summer and vacation plans are set, but that doesn’t mean that you can’t plan ahead. Many people make sure to plan their next trip before their current one ends so they always have something to look forward to. If you have kids, swimming and playing in the sand is great, but sometimes kids want more things to do than to sit around the beach. 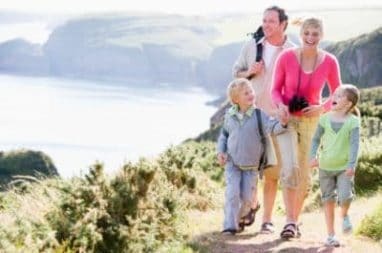 Here are family-friendly suggestions that can suit kids of all ages and interest. Orlando. Here’s the thing about going to Walt Disney World in Orlando, Fla.: There is no shortage of activities. With four parks to choose from (Magic Kingdom, EPCOT, Animal Kingdom and Disney’s Hollywood Studios) you can take your kids to a venue that meets their interests. If the Disney parks aren’t your thing, there’s always Universal Studios which offers movie themed rides and attractions with fun for all ages. Rocky Mountains. Whether you are looking for a summer vacation of hiking the mountains or a winter vacation of skiing and snowboarding, the vastness of the Rockies – stretching from the northern part of British Columbia, Canada to northern New Mexico – offers a location for anyone. So whether you want to test out the challenging slopes of Aspen, Colo., or stroll through the streets of Park City on a beautiful July day, a trip to the Rockies can be a year-round adventure. Hawaii. Even if sitting on the beach isn’t your child’s idea of a great vacation, there’s so much more to Hawaii than that. Each of the four main islands – Hawaii (the Big Island), O’ahu, Maui, Kaua’I – offer something different and exciting. The Big Island, home to the world-renown Kona coffee has Hawaii Volcanoes National Park to explore; you can even take a helicopter tour from Hilo over the coastline and, if you’re lucky, you can see the lava hitting the ocean. O’ahu, where the capital of Honolulu is located, has the stunning Pearl Harbor Visitor Center and the USS Arizona Memorial. Or you can go to Waikiki Beach to learn how to surf at the birthplace of modern surfing. In Maui, you can trek to the top of Haleakala National Park, 10,000 feet above sea level to see the sun rise – and bicycle down if you’re adventurous. Also for the adventurous is the scenic Road To Hana. Kaua’I offers visitors sights like the Napali Coast and Waimea Canyon. Camping. Fun fact: 27 states and two American territories have National Parks, with California (nine of them) and Alaska (eight) leading the way. But even if you don’t feel like making a drive to Arches in Utah or Shenandoah in Virginia, there are always state parks, regional parks and even privately owned campgrounds that can make for a fun adventure. Wisconsin Dells. You wouldn’t expect this small town in Central Wisconsin to be the “Water Park Capital of the World,” but with five indoor waterparks, it’s hard to doubt the claim. Resort hotels are built with massive waterparks that are reserved for its guests. With other theme parks available for use by people staying in hotels without parks. If you want a break from waterslides and wave pools, there’s also zip-line tours, duck boat tours and golfing to enjoy. If you’ve decided to drive to any of these places, your car may not have a lot left in it. If that’s the case, consider donating it to Wheels for Wishes benefiting Make-A-Wish. You get a tax deduction and the proceeds from your car being sold will help grant the wish of a child in your community. What are your plans for a family vacation? We’d love to hear your thoughts, so share your ideas on our Facebook and Twitter pages.